The CBC has an interesting article up right now discussing the growth of interactive fitness facilities for children in Canada. According to the write-up, a study by the the International Health, Racquet and Sportsclub Association found that 1.3 million children ages six to 11 are members of a health club. A growing % of these children are finding interactive gyms, equipped with variety of video games consoles hooked up to exercise machines, to be a motivational alternative to traditional health clubs. Bulldog Interactive Fitness For Youth, Canada's first interactive fitness facility is a leading this new craze with 10 locations across the country since it's inception in 2005. 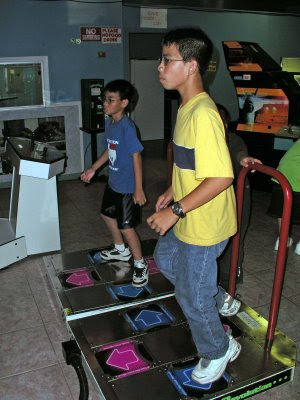 The gym offers interactive programs for children aged 3 to teen, which include games such as Dance Dance Revolution, racing game DiRT (hooked up to an exercise bike), and Wii Sports. Very cool indeed. Last year we heard of one gym in Vancouver that has introduced a similar type program for adults. With the number of gamer-cise gyms opening their doors and the current Wii fitness explosion, I wonder if we're seeing a true paradigm shift in the way we perceive exercise. Nice post, Bulldog is certainly making great headway in active gaming!